Planning a family photoshoot can be quite stressful... but it doesn't have to be! We've put together this guide with a few tips to help make this a fun, exciting and memorable experience for you! Think about what you want to do with your photos. Knowing this can also help you decide on a location and outfits. If you are looking to hang a large photo in your formal dining room, you may want to wear formal attire to match the mood in the room (possibly at a downtown NJ or NYC area, estate or country club?). Maybe you are looking for a wall collage for your family room and prefer to keep it more casual. Or maybe you want both because having both is more fun? How about an album for the grandkids to enjoy someday? Letting your photographer know this ahead of time will allow them to better prepare you for your session and your final gallery of images. This is a big one and probably the most stressful part of the whole process! The goal for coordinating a family is to visually break up the colors so that you're not all wearing the same color on top and bottom. The more we can mix that up, the better! We encourage you to think about planning each outfit with dominant colors and accent colors in mind. If you can aim for each family member to have a different dominant color and then tie in and vary the accent colors, it's going to all look great together! 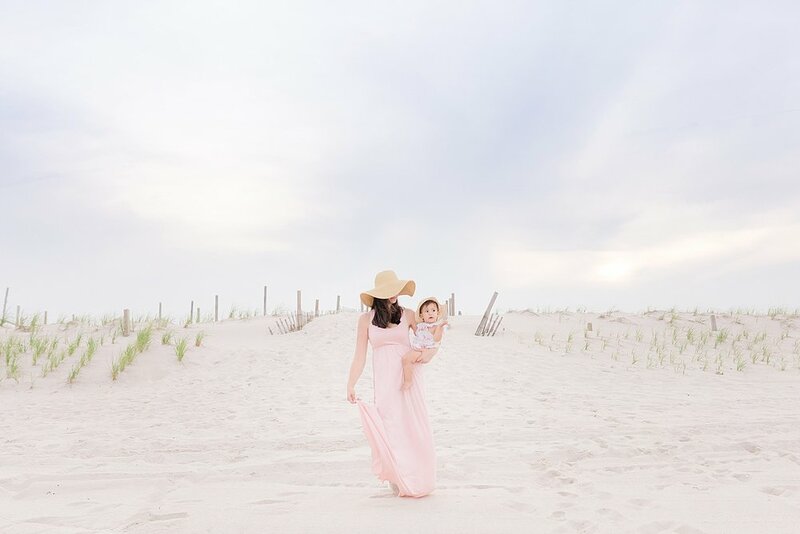 Most of our mamas choose their outfit first and then build the rest of the family's outfits based around that and you can even base your colors off the decor in your home where you will display the photos. Also, don't forget the shoes! Having the right shoes will really pull everything together (barefoot at the beach always works best, and one less thing you have to worry about!). Accessorize. Statement jewelry, hats, sunglasses, scarves, flowers, and flower crowns can all bring your photos up a notch! A pretty big rule when choosing outfits; stay away from large logos and ultra bright colors. Logos tend to be distracting and those bright colors can and usually will, reflect onto your faces. Leave plenty of time to get ready. Moms are usually the ones running around like crazy, trying to get everybody ready (even Dad!) and the last thing you want is to be running late or leave something behind...or even worse, have no time for yourself to get ready! If a family were to show up to a session rushed and disorganized, it might set the tone for a rushed and disorganized session. It would just be too hard for you to relax. You should think about getting your hair and makeup done in the morning and come home feeling confident and ready to take the day by storm! Add personal items or props to your session. While I don't think props should be used throughout your entire session, you can think about "styling" your session for an editorial feel, or make it more personal by adding or doing something sentimental to your family. Whether you like to cuddle up with a good book or want to have ice-cream at your favorite shop at the shore, you can totally do that! Anything that will tell people more about who you are right now and what you're into, is something you will really appreciate having photographed years down the road. Even something like a flower crown on the girls or bringing a beach cruiser with flowers in the basket would be super cute! Something large like a classic car or something small like a blankets or hats could be a fun way to make your session more unique. Not everyone has to be looking and smiling at the camera at all times. Things will begin to unfold during your session and the best photographs are often the ones where everyone is engaged with EACH OTHER, instead of the photographer. Let the moments happen naturally. Don't get upset when someone isn't cooperating. A good photographer will know how to distract or engage when necessary, when to photograph what, how to direct when needed to, and they will tell you when they need everyone looking at the camera. Just roll with it. At the end of the day, all that matters is the memories you make together. Be yourselves, enjoy it, have fun together, and laugh a lot!